The UK has a number of research groups with high international standing, working on image reconstruction and analysis for either PET or MR. We aim to bring these groups together towards the goal of synergistic PET-MR image reconstruction and analysis by advancing understanding of PET-MR and the algorithms used for each modality. We will foster links with the wider international PET and MR communities to further achieve this goal. 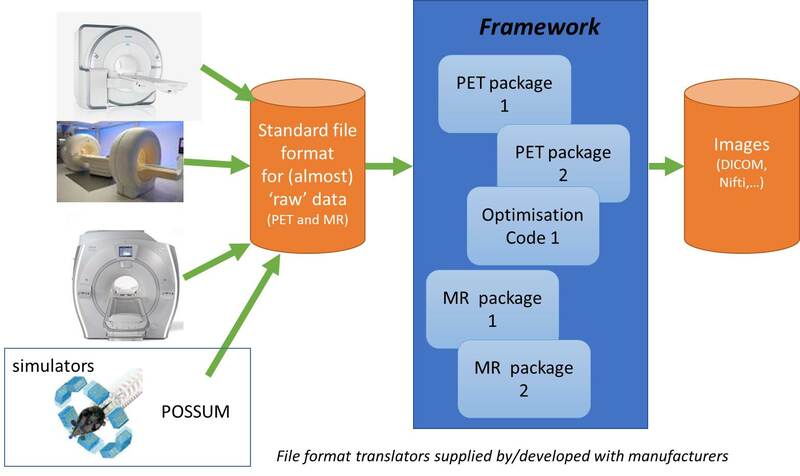 We aim to provide enabling infrastructure for research in PET-MR by development and promotion of a common software framework to tackle the specific challenges of PET-MR imaging. This will be achieved by standardisation of data formats, creating tools to export data in these data formats and development of a software platform for integrated PET-MR image reconstruction. CCP PET-MR is funded by the EPSRC from 1 April 2015 - 31 March 2020. The PI is Kris Thielemans (UCL) and the CoIs are Julian Matthews (UoManchester), Andrew Reader (KCL), Claudia Prieto Vasquez (KCL) and David Atkinson (UCL).